As business reliance on rapid and readily available technology continues to rise, enterprise data centers, colocation providers and premise network facilities need power management solutions that support today’s rising power densities and remote monitoring requirements. Chatsworth Products (CPI) provides an extensive line of power management products and technology that deliver safe and efficient power distribution to all applications. 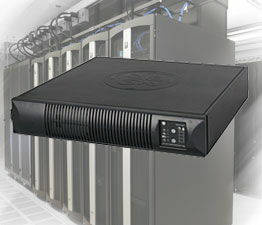 Ranging from the innovative features of eConnect® Power Distribution Units (PDUs), such as CPI’s new, patent pending Click Secure Locking Outlets and Secure Array™ IP Consolidation, to basic Power Strips and In-Line Meters, each of CPI’s power management products are specifically designed with flexibility and scalability in mind. 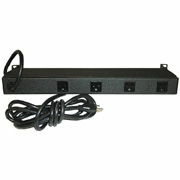 Power Distribution Units (PDU) provide advanced power distribution with optional network monitoring and controllable outlets. High-density computing means complex power distribution, monitoring and reporting. CPI offers a wide range of power products that help reduce the complexity of delivering power to equipment, including 3-phase PDUs equipped with power monitoring that stretches across the enterprise. Also accessible through an IP connection, your IT team can monitor anything from anywhere—all the way down to the device level. CPI’s eConnect® PDUs are a new generation of intelligent power distribution products that connect you to your evolving enterprise data center. Designed to withstand the heat loads of any hot aisle environment and available in more than 180 standard configurations, eConnect PDUs are delivered ready to manage your power distribution needs. CPI also offers a selection of PDUs with a variety of features similar to eConnect but without the full feature set or low profile design available with the eConnect product line. These PDUs include both horizontal and vertical mounting in CPI racks and cabinets, are UL Listed and capable of handling high density applications. CPI’s uninterruptable power supply (UPS) products provide critical power protection for small to mid-size server, data storage, networking, telecom, point of sales and office applications. CPI’s power management solutions have expanded to include state-of-the-art single phase UPS products from GE Critical Power to provide battery backup and equipment protection from any fluctuation in your power source for all business-critical applications. Whether integrated with CPI Cabinet and Rack Systems or independently each UPS from GE Critical Power and CPI delivers trusted, reliable power in a compact footprint. Select the IT series UPS for a cost-effective, high quality power protection for workstations, telecom and point-of-sales applications. Select the VH series UPS for critical, online double-conversion power protection for PC and server, telecom, laboratory and networking applications. Select the GT series UPS for critical, online double-conversion power protection for PC and server, call centers, telecom, security and VOIP applications. Select the LP-11U series UPS for high quality, transformer based power protection for healthcare, maritime, automation and retail applications. 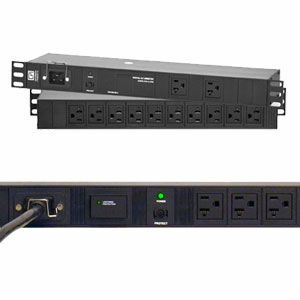 CPI Power Strips provide basic power distribution into racks and cabinets allowing you to share a single power connection with multiple pieces of equipment. Select from basic or metered models. Available in both vertical and horizontal versions. NEMA or IEC style outlets and plugs. Includes a thermal circuit breaker to protect circuits from overload. Optional surge-protection to protect equipment from power spikes. Optional local current meters to provide easy current monitoring. Optional lighted master switch or thermal circuit breaker. 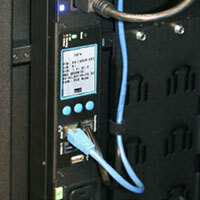 Use PowerScope In-Line Meter to upgrade your basic PDU for real-time power monitoring. When you upgrade a basic and locally metered PDUs with an in-line current meter you will enjoy real-time power monitoring which is essential to improving power usage effectiveness (PUE) in your data centers and equipment rooms. Additionally, it will help identify power problems and track power demand, allowing you to organize IT processes and equipment for the most efficient use of available power. In-line power meter with NEMA, California Style or IEC style connectors. Select models available with local current meters to provide easy current monitoring. Integrates with Scalable Enterprise Management Application (SEMA) software providing real-time IP-based power monitoring across your entire enterprise. Available for single-input, dual-input, single-phase or three-phase PDUs. 19″W x 1U x 9″D (230 mm). Includes two-post mounting bracket; power cord is attached.